Georg Jensen sterling silver dolphin brooch. The Duchess of Cambridge appears to be starting a new jewellery trend with her penchant for brooches. 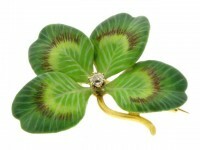 Each is charmingly themed to the particular occasion. The earliest brooch sighting occurred on the first official visit of the royal couple after their marriage, to Canada last July, when she wore a diamond and platinum maple leaf brooch borrowed from the Queen, who also wore it for a state visit to Canada in 1951. On Saint Patrick's Day of this year Kate sported a gold shamrock brooch for her visit to the Irish Guards at their barracks in Aldershot. For the Queen's Jubilee celebration, on the third of June, on the royal barge she wore another event-appropriate brooch-a maritime-themed silver double dolphin brooch, a wedding gift from the Submarine Division of the Royal Navy. This week Kate wore a stunning Art Deco diamond and platinum necklace by Cartier with numerous hoops, reminiscent of the Olympic rings, in honour of the 2012 London Olympic Games which officially open on the 25th of July. 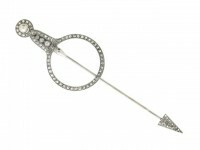 Wouldn't our Art Deco diamond and platinum Cartier brooch have matched perfectly? See a selection of brooches similar to those worn by Kate here, or search the Berganza collection for one which would perfectly suit the theme of your own special occasion.